Manfred is a horrible man who, along with his henchmen, kidnaps the most skilful inventors. He threatens to feed them to his piranha fish if they don’t follow his orders. He forces them to build machines that allow him to rob aeroplanes, raid art galleries and carry out acts of piracy. When his henchman make mistakes, however trivial, he enjoys humiliating them. One night, however, Manfred goes down with a dreadful cold. He feels awful and goes to bed, expecting someone to bring him some soup or come and read him a story, but nobody does come. In the end he rings the doctor, who tells him plainly that no-one wants him to get well. Only when Manfred promises to give back everything he has stolen and be a good man does the doctor agree to come and look after him. When Manfred is better, he keeps his promises. He pays inventors to develop machines that will build new art galleries, carries out missions of mercy and gives children pleasure rides. He talks politely to his henchmen and even makes them sandwiches. He appears to be too good to be true, but is he? When everyone is fast asleep at night, he occasionally gets an irresistible urge to go out, ring someone’s doorbell, and then run away before anyone sees him. John Fardell’s story of Manfred the Baddie is filled with action, adventure and humour. It is of course all highly exaggerated, but it makes for a book that will hold the attention of almost all young children. It’s the perfect length, and there is never a dull moment. It may sound like a story that will appeal more to boys than to girls, but it is so entertaining that it is unlikely that any child will not want to find out what happens to Manfred in the end. The text of Manfred the Baddie is set in a large bold font but it isn’t the simplest of fonts. The amount of text per double page varies from three words to several paragraphs. In general, when there is a very small amount of text it is superimposed on an illustration, but when there are whole paragraphs they are set on a white background. On one page a line of text appears on quite a dark bluish-purple background and it is a little difficult to decipher, but this is the exception rather than the rule. As well as the main narrative, there are speech bubbles in some of the smaller illustrations that add details and are usually amusing. They could, however, be omitted if an adult is reading the story aloud to a very young child who does not have a long attention span. The vocabulary of Manfred the Baddie is quite descriptive, but other than words such as “henchmen” and “diabolical” it is not difficult to understand. John Fardell has provided the illustrations for Manfred the Baddie himself and it looks as though he has had a lot of fun doing so. The double-page spreads where there are just a few words of text give the impression that the illustration is in fact the most important element of the story. Manfred and his henchmen swoop in above an aeroplane and seize chests full of treasure with huge iron claws against the background of a vivid yellow sky. Manfred himself has a bald head and a broad face with a huge mouth that turns upwards or downwards according to his mood. There are parts of the book that almost begin to resemble a graphic novel with smaller illustrations containing dialogue in speech bubbles. Colours range from vivid primaries to more sombre combinations for night scenes. 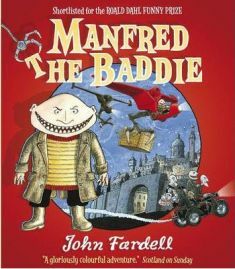 Fardell’s Manfred the Baddie would make an entertaining read-aloud book for children aged three and up. The fact that it has sections that look like a comic strip or graphic novel and also longer paragraphs of text would make it suitable for young independent readers as well. It moves at a fast pace and contains a good dose of humour; it certainly isn’t too childish. This is a lively picture book that is likely to appeal to quite a broad range of ages. It’s definitely worth borrowing from the library, but it’s one that boys in particular will probably want to read again and again. No Comments on "Manfred the Baddie"